I got a call on Friday from Cindy our Rehab Director. 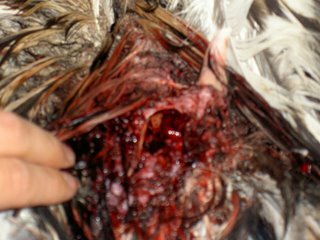 We have a eagle coming in from Soldotna on Saturday morning with a compound fracture to it's right wing. She was going to be out of town and was wondering if Ruthie and I could pick it up at the airport. You already know my answer. I told her to go ahead and give Liz of the USF&W in the Kenai NWR my cell number to contact me. Liz called me the next morning. There was a possible hold up at ERA Aviation. This is the beginning of salmon season and there might not be room for our eagle. ERA donates the flight, so beggars can't complain. They said they would do the best that they can do and they did. The eagle landed at 12:45 and we had it in possession by 1:15. We took it to the clinic with the idea of placing a wing wrap on it and bedding it down for the weekend. When we got there we prepped a mew with some food and water. We had to take the top off of the kennel to get him out. It was a small kennel, I presume because of the aircraft size and to limit the eagles movement. It was a young eagle, maybe 2-3 years old. His head feathers were changing color. We new there was a problem when the wing would not go the way it should. As I held the eagles feet and head, Ruthie examined the wound. By her remarks that I won't repeat, I new it wasn't good for she has a lot more experience than me when it comes to the medical side. We discussed it and decided that we needed more help. Since Cindy wasn't an option, we called Barbara Doak. She's been a volunteer at Bird TLC since 1990 and was at one time the Rehab Director. She recommended we take the bird to Pet Emergency, a 24hr animal hospital that takes in birds when Bird TLC isn't available. We kenneled him in a larger kennel and off we went. When we arrived we were greeted by the staff which included Bobby Beckman, a former volunteer at Bird TLC and son of one of our eagle presenters, Gloria. At Pet Emergency, they donate the time and materials used to take care of the birds that come through there. Right off the bat I felt comfortable that we had taken the eagle there. The staff was very helpful and friendly. They said it would be a little bit. They were going to knock the bird out to examine it and wrap the wing. So we went to lunch. When lunch was done we headed back. Barbara Doak was leaving the parking lot when we arrived. She had checked in on the bird and brought food for it for the weekend. We went inside and saw that he was fine and still real groggie from the drugs. 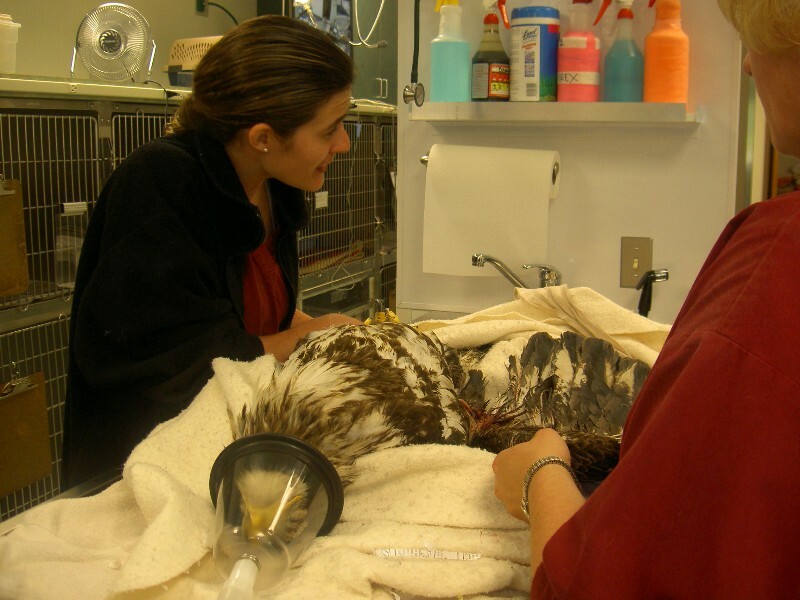 Barbara wanted them to keep the eagle and she would pick it up on Tuesday when she went to the clinic. It was smart to take the bird there. The wound was huge and the bone was sticking out. They were able to place the bone back in the wing and then wrap it securely. Chances are on Tuesday after Barbara picks it up, it will go to Pet Stop for x-rays. Hopefully the wing can be pinned and in time it can be released. Thanks to Shell Stachowicz for taking the pictures and emailing them to me. Also, thanks to the professional staff at Pet Emergency. They were able to make this injured eagle more comfortable then we could for the weekend. Thanks to ERA for the flight and getting the bird onboard as soon as possible. Thanks to Barbara Doak for her advice and thanks to Liz with USF&W for trying her best by herself on the holiday weekend. Update - Be 06-27 went into surgery today and recieved a stainless steel pin in it's right wing. The pin will be removed in a few weeks after the bone starts to heal. Newer PostDo we have baby birds? Sure.